EURUSD’s fall from 1.1961 extended to as low as 1.1827. However, as long as the price is above the bullish trend line on the 4-hour chart, the fall could be treated as consolidation of the uptrend from 1.1554, and another rise towards 1.2092 (Sep 8 high) previous high is still possible after the consolidation. 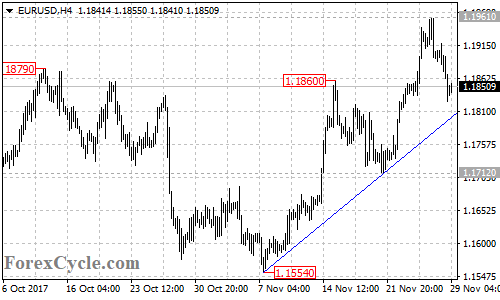 On the downside, a breakdown below the trend line support will indicate that the uptrend had completed at 1.1961 already, then the pair would find next support at 1.1712. Below this level could trigger further decline towards 1.1554, followed by the resistance-turned-support trend line on the weekly chart now at around 1.1390.